March 18 marks The Paul Reveres’ 3rd Anniversary! Hard to believe I’ve been working on the comic for 3 years. Time flies! To commemorate the date, I’m having a giveaway contest on Johnny’s Facebook page! Just friend Johnny and comment to his Contest status update with the name of your favorite character and you’ll be automatically entered to win one of the 3 prize packs. Winners will be announced and contacted on Facebook on Monday, March 19 at 12:00 am EST. 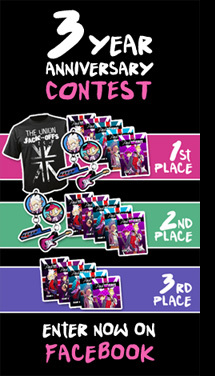 First Place: Union Jack-Offs T-shirt, Issues 1-5, Benedict Charm, Paul Charm and a sketch of your favorite character! Second Place: Issues 1-5, Benedict Charm, Paul Charm and a sketch of your favorite character! Third Place: Issues 1-5 and a sketch of your favorite character! Click the contest photo to the left to check out Johnny’s page and enter the contest! :| This is so ridiculously terrifying. The first 3 panels complete the trifecta from Awkward Hell. And then it only gets scarier. If there’s something I know, it’s Awkward. I’m going to list it on my resume as a specialty skill. LOL. Love the Pokemon reference! Johnny chooses to hang out with some weird people. Psh, Cilla has standards and they are all called “Johnny”. XD No more room for love for poor Rab! Those were all really good tones. I remember we named the CD for it “Dinosaur Feces.” I have no idea why.